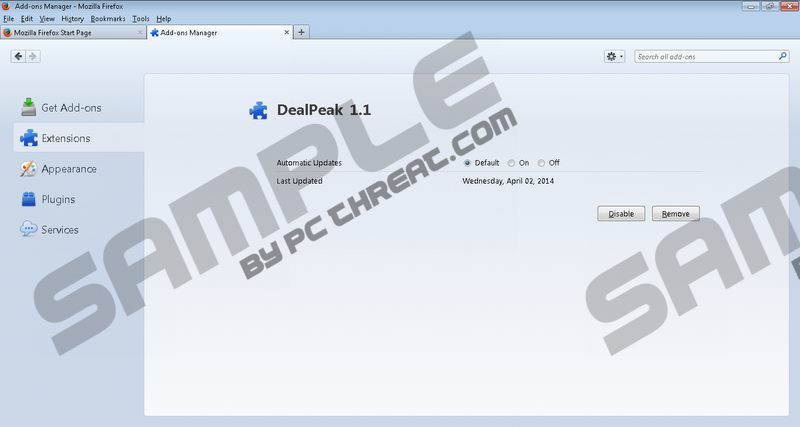 DealPeak is a browser extension which you can be provided with by various bundled installers. If you pay no attention to the license agreement that is displayed in front of you once you launch the installer, DealPeak gets installed on Internet Explorer, Google Chrome and Mozilla Firefox. It is important to note that the application generates random names. You can find it installed as DeeaLpeaK, deaAlpeAk, etc. The different versions of DealPeak do not remain active for a long time, which means that after a certain period of time, the application can stop displaying advertisements. Nevertheless, it is highly advisable to remove it from the PC to prevent data loss or malfunctions of the system. DealPeak can display coupons, web banner, and pop-up advertisements, all of which belong to third parties. DealPeak is not liable for the content that is display and does not govern third parties. Once you access a third party website using the DealPeak application, you start interacting with that particular website. If it is an unknown website and you want to download or buy something from it, you should make sure that the websites is reliable. There are a great many deceptive websites that seek to make you install adware programs, trial versions of system optimization tools, and other free applications, some of which may collect information about you and send it to third parties. DealPeak may seem to be a useful application, especially when it is promoted on an attractive website. Dealpeak.info is the official website of this adware program; however, at the moment of writing, it does not provide users with the installer of the application. If you have recently installed DealPeak, it is very likely that your computer contains some other unreliable programs. It has been found that DealPeak can be promoted by the InstallRex installer and is usually bundled with EZDownloader and some browser hijacker, including websearches.amaizingsearches.info. If your Internet browsers are hijacked, you should take immediate action to remove the browser hijacker in order to prevent data loss. Below you will find our instructions on how to manually remove DealPeak using the Windows Control Panel, but if you want to be sure that the unwanted application is fully removed and that the operating system is properly protected against malware and spyware, you should implement SpyHunter. This anti-spyware tool will terminate the adware program and safeguard the system against various threats. Click Uninstall the program and uninstall DealPeak. Click Uninstall the program and remove the unwanted application. Quick & tested solution for DealPeak removal. Uninstalled it, but still the extension re-installs itself.